LAWRENCE, Kan. – Senior guard Lagerald Vick exploded for 19 of his 27 points over the final eight minutes of regulation and overtime to lift the No. 2 Kansas Jayhawks to a 90-84 come-from-behind win over the Stanford Cardinal Sunday evening inside Allen Fieldhouse. Kansas outscored the Cardinal 33-21 over the final 12 minutes of regulation to force it’s second-straight overtime and turn a 12-point second-half deficit into its sixth win of the season. The victory moved KU to 6-0 on the year, while Stanford suffered its fourth loss, now sitting at 4-4 in 2018-19. After going 0-of-6 from long range and shooting a season-low 40 percent from the field in the first half, KU’s shots started dropping in the second half, connecting on 53.6 percent from the field and 57.1 percent from long range, however, the Jayhawks would need five extra minutes to secure their 90-84 victory over the upset-minded Cardinal. KU trailed Stanford by as many as 12 in the second half, but a 10-0 Kansas run capped by a Vick 3-pointer put the Jayhawks ahead, 62-60, with under six minutes to play in the game. Stanford battled to keep the game close though, and owned a 75-72 advantage with 12 seconds remaining in regulation. 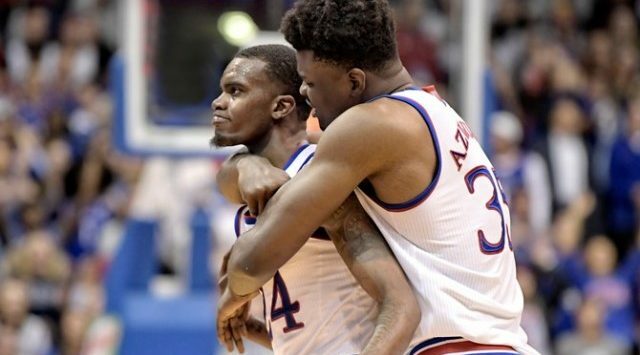 Vick was the man who had his number called to take the final shot, which he converted to tie the score at 75-75 and send the Jayhawks to their second overtime in as many games. In the extra period, Vick continued what ended a personal 11-0 run with two more 3-pointers and a one-handed slam to seal the KU win. Four Jayhawks posted double-figure scoring efforts against Stanford, led by Vick who scored a game-high 27 points on 7-of-11 shooting from beyond the arc. Vick made all seven of the Kansas’ threes. Redshirt-junior forward Dedric Lawson was the only other Jayhawk to score 20 points, notching his fourth double-double of the season with 24 points and 15 rebounds. Junior center Udoka Azubuike and freshman guard Devon Dotson added 18 points and 10 points, respectively. Azubuike fell just one rebound shy of a double-double, ending the night with nine boards.